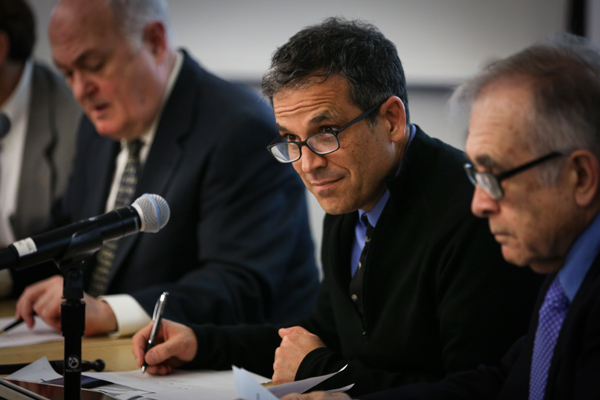 Forrest Maltzman, former senior vice provost for academic affairs and planning, has served as interim provost since Steven Lerman officially left the post in January. Officials have not yet started a search for a permanent provost. Officials said in May they will begin the search for a new provost this fall, about one year after former Provost Steven Lerman announced he was stepping down. Faculty and experts have said that finding someone who is able to lead the implementation of the University’s strategic plan effectively will likely be a major goal of the search. The strategic plan was created in 2012 by Lerman and was recently evaluated by officials. Since Lerman stepped down in January, Interim Provost Forrest Maltzman has taken over the role. He has used his time in the position to reorganize the provost’s office. These changes have included combining GW’s online learning office and the teaching and learning center, moving veteran services under the Division of Student Affairs and shifting responsibilities for the vice provost for diversity, equity and community engagement. Other changes in the provost’s office involve three ongoing searches for a director of retention, director of Mental Health Services and dean of admissions. The vice provost for faculty affairs, Dianne Martin, will retire from her position in August, and the associate provost for academic affairs on the Mount Vernon Campus, Shelly Heller, will also be stepping down. In May, officials announced that they had hired a new vice provost for diversity, equity and community engagement, Caroline Laguerre-Brown, who will take over the role on Aug. 1. The University cut 40 staff positions while reorganizing and combining a few offices in May as a result of University-wide budget cuts. These changes are the first in what is likely a series of alterations as a result of University budget cuts, which University President Steven Knapp said in December would call on all administrative units to cut their budgets by 3 to 5 percent each year for the next five years. The upcoming cutbacks will not cause budget decreases within the schools, and will instead come from central administrative offices. Officials announced in March that they would implement a new open dining program in the fall, which gets rid of the mandatory spending for freshmen at on-campus locations like J Street. While GW will still offer some on-campus dining options, they will be scaled back significantly, and students can use the Dining Dollars at any place that accepts GWorld. The changes fall in line with student leaders’ calls for more affordable and flexible dining options, citing a high cost of living in D.C. and few affordable options available on campus. The changes come after GW’s 10-year contract with Sodexo expired in the spring. Restaurant Associates, which also caters for the U.S. Senate office buildings, the Capitol Visitor Center, the Kennedy Center, the Newseum and five Smithsonian properties, as well as dining locations at Princeton and Harvard universities, will be GW’s new vendor. Many Sodexo workers said they did not know if they will have jobs in the fall, as the University scales back its dining options.